Davidson, North Carolina— Aside from his debate last week against Mike Pence, Democratic vice-presidential nominee Tim Kaine hasn’t made many big national headlines recently. On Wednesday, at a campaign stop in North Carolina, the Virginia senator made his role in the campaign clear: to act as a bulwark against the tsunami of misogyny unleashed by Donald Trump’s presidential campaign, and showing voters what it looks like when a man truly supports and promotes a woman. Kaine is working hard to model a style of male leadership that is not merely comfortable working on behalf of a female candidate, but is confident and joyful while doing so. During a week in which Trump’s recorded boasts about sexual assault, the allegations of sexual abuse emerging against him, and the unending sexist comments made by the candidate and his minions have made many of us feel we’ve endured low-level toxic poisoning, watching Kaine on the stump was reassuring—soothing, even. 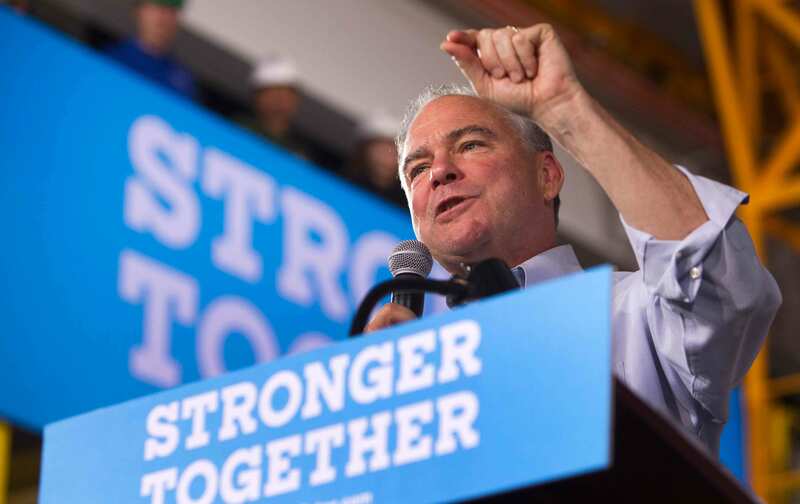 Kaine observed that the United States “has made it uniquely difficult for women to be elected to higher office.” Then he made it personal: “Can I just tell you one of the things that I’ve gotten to know very well about my running mate, Hillary Clinton? She has heard that her entire life: ‘This is not your time, maybe you can’t do it, somebody else is there ahead of you, why don’t you smile more?’ Or ‘Oh, this is just locker-room talk that you don’t understand,’ as Donald Trump said a couple weeks ago. Or ‘She doesn’t look very presidential, does she, fellas?’” He made the crowd think about the historic nature of this presidential race in a way polls tell us many millennials have not. And he did it in a way Clinton herself usually can’t. He sat down for a half-hour interview afterwards, for a wide-ranging discussion about his turnaround on the Trans-Pacific Partnership, his deference to Clinton on repealing the Hyde Amendment, and several other topics. Our conversation has been edited for clarity and length. Yeah, he kind of said ‘I’m gonna be the last one, for a while,’ after signing the Civil Rights Act. Well yes, clearly race plays a role, right? And I ask you, as somebody who people perceived was put on this ticket at least partly to do some outreach to those white working-class voters, is it possible to reach them? Or is it just tough for a party whose base is now heavily black, Latino, and female, is it just tougher to appeal to them? There is an anxiety about demographic change. If you’ve been in a place where the natural order is, it’s white males who run things—they’re the presidents, or members of Congress, or the CEOs, or whatever—you see that starting to change and it creates an anxiety. There are always gonna be the David Dukes of the world who have a racial animus, but most people are not that. But most humans fear change. So some of this is anxiety about demographic change. But there is a second anxiety which is really important, which Hillary and I have addressed during the campaign and will really address should we win, and that’s economic anxiety. You might live in a ZIP code or you might have trained up in an industry where you don’t see the path for yourself anymore. Of course, it’s not only white voters that have anxiety—Hillary and I really have to deliver on the first pillar of this campaign, which is an economy that works for everybody, not just for the few. We are both pro-choice Catholics, and I wanted to ask you about your stance on the Hyde Amendment, which prohibits federal funding for abortion. I understand that you support it, but you’ve said you’ll support the position of your running mate, who wants it repealed. I’m gonna do just what VPs do, which is give her my best advice, and then support her. But you’re somebody who’s always been a social-justice Catholic, who gradually became a pro-choice Catholic, and I wonder how you reached a place on abortion where you felt that ‘yes, this choice must be the woman’s,’ but you don’t feel that way when it comes to the choice of a poor woman who simply can’t afford it. I certainly see the argument on the other side. It’s just that, as I have defined “pro-choice” to myself, being a Roe v. Wade supporter: People grapple with the morality of this just as they did in 1973, when Roe was decided. But what Roe said is, “We’re gonna grapple with this on the moral level, but legally people are gonna make their own choices. We’re gonna respect whatever choice you reach on this issue.’” I always felt the Hyde Amendment was in accord with what “pro-choice” is, which is, you let folks make their own decisions, but nobody needs to support other folks’ decision. But look, the health-care access issue for low-income women is huge. This is why I’ve always supported Planned Parenthood. You’ve seen what’s happened in states like Texas where they put the [Targeted Regulation of Abortion Providers] regulations in place, they closed down Planned Parenthood clinics and others, and what you end up with is rising maternal mortality and death of kids before age 5. So I’m a huge supporter of health-care access for low-income women, that’s why I’m such a strong supporter of the ACA. Those of us who are in the pro-choice Catholic crowd: We know that greater access to contraception and health care generally is one of the very important ways to help if you are concerned about abortion. You’ve been in public life long enough to watch this shift: the first President Bush was a big supporter of Planned Parenthood and Title X; so were a lot of Republicans. Today it’s almost entirely a partisan issue. How did that happen? You know, I know why climate went from nonpartisan to partisan…. The oil and gas industry, specifically. So there’s some issues where I understand why they’ve gone to partisan. I’m not 100 percent sure that I fully understand why support for Planned Parenthood has become partisan. Except, in the Republican family, the division between the social conservatives and the business conservatives that has always been there—well, they’ve chased a lot of the business conservatives out. Jumping around a little bit: You have been a strong advocate for the need for Congress to vote on a new authorization of military force; the measures supported after 9/11, and before the Iraq war, really don’t extend to cover the current war we’re waging against ISIS, or where we’re waging it. Well, (a) it doesn’t cover it, and (b) by the time we come in in January, I think 75 percent of the Congress didn’t even cast a vote on it. So they’ve had nothing to say about the wars that are ongoing. Would you continue to push for that as vice president? Within the administration. Now, the good news is, Hillary very much believes Congress must weigh in. She doesn’t necessarily come at it from the legal perspective, she comes at it from a very pragmatic perspective, which is: A lot of Congress has never weighed in, and this battle with Al Qaeda has now morphed to ISIL, and is in different countries. We have a decade of experience and we ought to put it to use and think about: Why are we using military force and what would a definition of success be? The way the framers set it up, they really believed in dialogue: The executive puts a proposal on the table, and Congress grapples with it, and they probably amend and adjust it, and then the troops know they’re supported. That iterative process clarifies goals and objectives and what success looks like. You know, when you do the 60-word amendment right after the 9/11 attack, you didn’t define what success looked like and we got into all kinds of trouble knowing, what beyond going after bin Laden, is this about, and what would success in Iraq look like. We haven’t had that discussion in a very long time. But the president famously sought some kind of authorization from Congress for his plan to use force in Syria—and he couldn’t get it. Well, I was on [the Senate] Foreign Relations [Committee], and I remember casting that vote. I’d never cast a vote to use force, and especially with a kid in the military, that’s a very different kind of a vote. And I cast a vote to do it, I thought the president made a very good case, but you’re right, it was going to be challenging on the floor of the Senate. And yet, I still believe that what he wanted to do—which was a narrow attack against Syria to punish the for using chemical weapons against civilians and to tell them not to do it again—what he got was the destruction of the overwhelming majority of the stockpile, was probably pretty close to what he wanted and perhaps better. I don’t think he would have got that without getting the Foreign Relations Committee to say, yeah we’re ready to move forward. But the Congress has gotten lazy about this. Madison basically believed you have to have Congress do this so you don’t have executive overreach. Madison correctly understood the trend toward executive overreach; he didn’t understand the trend toward legislative abdication. If I can avoid a tough vote, I’ll avoid a tough vote. I mean, what vote is tougher? And what vote should be tougher? So we really have a problem. John McCain and I had a bill in to try to rewrite the War Powers Resolution of 1973, which everybody says has never worked. It would really establish what would be the consultative norm between the president and Congress. Not that having a norm would make these things easier, but not having a norm makes them tougher. It’s something that I continue to believe process improvements can be made. But I would very much like to work with Hillary and my colleagues to see what progress can be made. You know, we probably need to work on an authorization that focuses on the difference between doing something against a state, and a non-state actor. Because doing something against Al Qaeda, now focusing on ISIL, is different that contemplating a war against a nation that observes the Geneva conventions, they don’t follow any rules, so how do you conceive of military action against a non-state? That’s the challenge of a 21st-century military action that wasn’t a challenge of the 20th century, really at all. You voted to give the president fast-track authority for the Trans-Pacific Partnership—but now you’ve said you oppose the final version of the TPP. Because we didn’t do well enough in the negotiation. So what specifically did you find in the end that you oppose? Well, it was what I told him in May of 2015. We had the vote in June or early July, I was meeting with him a lot. I said, look, I’m gonna vote to give you fast track, because every president since Ford has had it, and I think you need it to negotiate the best deal possible. But I had a couple of concerns: I wanted to see strong labor provisions and strong environmental provisions, but I had a particular concern about enforcement. I mean, trade is going to happen. But why are people so concerned now about trade deals? I think it’s because they perceive we’re not negotiating deals that really protect ourselves. And even when we put in protections, we don’t enforce them. It’s better not to have a deal than to have one that isn’t enforced, because the ones that aren’t enforced make everybody cynical about it. So I told the White House back in May 2015 that I was concerned about the [Investor State Dispute Settlement] piece, because I was very concerned that a company that doesn’t like something that a nation has done can go into court and challenge it as an unfair trade practice. But what if a labor union wants to go and challenge a violation of labor provisions, or an environmental group? I’m like, “Are you kidding me?” This is just so unfair. It’s exactly the kind of thing that would lead to even more cynicism and skepticism. Yeah, it’s the sort of thing people complain about when they talk about “crony capitalism” or say government is siding with business. Only business can take advantage of this dispute resolution. And you see how businesses do it. So Trans-Canada, when they wanted to build the Keystone Pipeline, which I opposed, we didn’t make that decision as an unfair trade practice, it was purely an environmental decision. But Trans-Canada files a $17 billion trade claim with the ISDS! They may lose, but they’re gonna tie us up for a long time, they may force us to settle, they may get some money from us. But they shouldn’t be able to bring this up in this kind of private forum, or at least what’s good for the goose should be good for the gander, and the fact that we haven’t made that accessible to labor and environmental organizations, that is evidence of the unenforceability of this deal. Can you imagine any scenario, if it comes to the lame-duck session before the next Congress, where you would support it? Yes. Because it gets voted on, up or down. No amendments, up or down. I’m not voting for it. Hillary’s point is, does the deal increase jobs, increase wages, protect America’s interest—and can you enforce it? It’s gotta meet those standards. And you know, you’re a Catholic—this is not a venial sin, this is kind of a mortal sin. Especially when I’m in the South, I hear a lot of positive things about Howard Dean’s tenure as DNC head, and his commitment to the 50 state strategy. They really want a return to that—especially in places like Georgia, and even in South Carolina. [State Representative ] Gilda Cobb-Hunter, who’s a DNC vice chair, is always talking to me about the importance of that. She’s always saying, “We don’t have to remain a red state, look at Georgia, look at Virginia.” I’m just wondering, since you were DNC head as well, how well you think the party is doing trying to turn red states purple, and purple states blue, especially given your experience in Virginia. Howard and I did it slightly different. He said, “I’m gonna give state parties money to hire staff,” and we had the [Organizing for America] staff that we farmed out to the states. I ended up with a little more control over them—Howard gave the states the money, which they really loved, I ended up with a little more control over them. But Howard and I both believe, you’ve got to try to be competitive everywhere. The exact right model to do it—do you do it giving the state parties money?—that’s a subject for negotiation. But Howard’s idea, which I just copied, was if you’re not even making a play in the hard states, how will you ever make them better? No, I was not. But I watched it at a Harlem restaurant, it was black, Latino, white, gay, straight, an incredibly diverse crowd, and people thought you were great! They really wanted someone to push back. They thought you won, too. But I do have to ask: Do you have any regrets about not bringing up Pence’s stance on LGBT rights? Yeah. Yeah, I do. In a 93-minute debate, I kinda thought I’d get a question on it, I thought that was so obvious. You know one of the things, in a debate, you get questions, and you can bring a couple of other points in. So you think: I think I’m gonna get asked about this or that, so I’ll wait, but that was one I didn’t. So the only LGBT thing I brought up was him praising Putin, I was like, “I mean, are you kidding? Putin is persecuting LGBT folks, he’s persecuting journalists.” I was sure I was going to get a chance to come back. But my whole thought about that debate was, I was not there to debate Pence, I was there to win the election. And winning the election is two things. One, I didn’t want any stories written the next day, saying any new line of attack had opened up on Hillary. And that was good, nothing about Hillary the next day. And second, since I got on this ticket, I’ve been trying to drive a wedge between the GOP and Trump. So the question I was asking Pence was a rhetorical question: How can you defend this? I didn’t know I was gonna get such great evidence three days later [with the Access Hollywood tape bragging of sexual assault]. But now every Republican officeholder is getting that question. You supported Senator Obama in the 2008 Democratic primary. What have you learned about Hillary Clinton in the last few months that you didn’t know back then? Let me say first: It was very hard to choose between Barack Obama and Hillary Clinton at that time. It was only made easier in that I knew Barack very well, and I did not know Hillary well. You know, Barack’s mother and maternal grandparents are from El Dorado, Kansas, and so were mine. And look, my whole political career has been on the civil-rights path. To be a civil-rights lawyer, to be mayor of a predominantly African-American city, to be governor of the capital of the Confederacy, in Virginia, which has so much pain and scar tissue, the ability to say: “I know you, I think you’ll be good, and I think you can get Virginia from facing back to facing forward”—to me, it just seemed like the arc of my life said I should support him. But it wasn’t easy, in the sense that I knew enough about Hillary to know she would be great. Yeah. And she’ll tell that story as an accomplishment story: I worked on CHIP and 8 million kids got health care. But I tell it more as a story that tells you something about who she is: Which is, I’m really focused on what I care about, and I don’t care even if I lose, I’m still gonna get up the next day and try to do it. That’s who she is. When you think of what every president will confront, you don’t want somebody whose resolve is gonna be shaken. And I just have rock-solid confidence in her about that.